Faced with the limitations of their on-premises agility, storage, and computing capabilities, financial institutions of all sizes—FinTech startups, hedge funds and asset managers, insurers, commercial banks, and global investment banks, among others—are working with Amazon Web Services (AWS) and AWS Partner Network (APN) Partners to become more agile, cost-effective, and customer-centric. As AWS continues to enable scalable, flexible, and cost-effective solutions for banking, payments, capital markets, and insurance organizations of all sizes, it has also become evident that our highly specialized APN Partners need to organize by industry and develop solutions to better serve our customer needs in this industry. There’s a clear opportunity to help AWS customers within Financial Services to succeed in moving to AWS Cloud, and for the APN Partners to support the seamless integration and deployment of these solutions. As the financial services industry slowly but surely moves to the cloud, AWS has established the Financial Services APN Partner Competency Program to identify APN Consulting and Technology Partners with deep industry experience to assist our customers in this industry. These APN Partners have demonstrated industry expertise, readily implemented solutions that solve specific business problems, align with AWS architectural best practices, and have AWS-certified staff. They have gone through a rigorous business and technical validation by AWS teams and are closely engaged and aligned with AWS global financial services team. 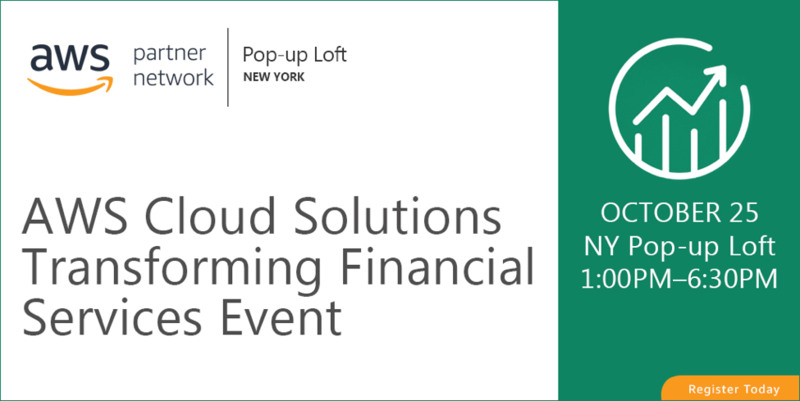 There is a great opportunity to join this upcoming solutions showcase event in New York, led by our AWS Financial Services Competency Partners, to learn how their solutions are helping customers succeed and to join in on the conversations following the sessions. Not only will you hear from our top APN Partners in the industry, you will get an insight on trends in cloud transformation as the financial services industry intensifies its focus on innovation. Learn more from Brad Bailey, Research Director in Capital Markets at Celent, about trends in the financial service’s cloud transformation focusing on governance, risk, and compliance (GRC). Celent helps firms in the financial services industry make better decisions about technology through research and advisory. You will also have an opportunity to hear from Phil Moyers, AWS Director, Global Financial Services, about industry innovation at AWS. Don’t miss this complimentary event – register now! Seating is limited. CTP (Cloud Technology Partners): CTP’s Continuous Compliance solution provides a single source of truth across Governance, Risk and Compliance (GRC) enabling real-time monitoring and remediation recommendations on AWS Cloud. Domino Data: A single system for all your models -Documentation, code, and model inventories inevitably get out of sync when spread across systems. Domino solution tracks the provenance of a model from idea to impact, showing who worked on it, what they did, how they deployed it, and how it is used in production. Nice Actimize: Nice Actimize ABC solution analyzes transactions and behavior across the organization and the supply chain, for a real-time, up to date view of their bribery and corruption risk across business, geographic, vendor and customer lines. External risks integrated AML lifecycle management that delivers insight across the breadth of customer activities, ensuring smart and cost-effective AML operations as well as a positive, holistic customer experience. Accenture: This solution will focus on risk management using high power computer (HPC) of AWS. No longer do companies have to procure hardware in anticipation of high-compute workloads, and then let it sit idle when not used. Instead, operational tasks of running compute on AWS are simplified because you can fully automate provisioning and scaling by treating the infrastructure as part of your code base. FICO: FICO Xpress Optimization, as part of the FICO Decision Management Suite, helps financial services organizations identify and fine-tune policies and processes across the customer lifecycle to improve Key Performance Indicators (KPIs) subject to business, operational and legal constraints. This is achieved by combining sophisticated analytics with powerful, easy-to-use optimization software and consulting services. IHS Markit: Financial Risk Analytics from IHS Markit provides a range of financial risk management solutions on a single, integrated, yet modular platform. The solutions deliver support for counterparty credit risk requirements, pricing valuation adjustments and the Fundamental Review of the Trading Book (FRTB), and can be deployed on the AWS cloud. GFT: GFT’s regulatory reporting service on AWS helps financial institutions manage, transform, and store data securely. With support from AWS, GFT offers innovative flexibility, transparency of regulatory data requirements, and proactive management of regulatory data reporting in a cloud-based solution.